Oregon, and Portland, pioneer Asa Lawrence Lovejoy was born in Massachusetts on March 14, 1808. He studied at Cambridge and Amherst, and became an attorney. Lovejoy left Boston and arrived in Oregon in 1843. He settled in Oregon City, practiced law, and began a long career in politics. He claimed a tract of land on the Willamette River in a spot that would one day become Portland, but at the time was just a small clearing. Eventually Lovejoy decided the spot wasn’t for him and sold his claim to Francis Pettygrove, but not before losing a coin toss for naming rights. Mr. Pettygrove, from Maine, chose the name Portland. Mr. Lovejoy had preferred Boston. 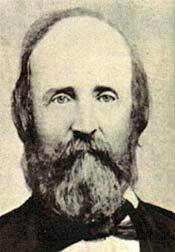 Lovejoy served in the Oregon Territorial Legislature, and was a delegate to the Oregon Constitutional Convention in 1857.